Leda takes her name from the beautiful wife of Tindaro, queen of Sparta, protagonist of one of the most fascinating and controversial myths of the Greco-Roman tradition. She was born in an ancient medieval village, an historical Roman camp, in the north of Calabria, a land between the two seas: Tyrrhenian and Ionian . The combination of land and sea is alive in all her collections and, in particular, in her prints. Her curiosity is the draving force that leads her to wonder the reason of all the many realities that surround her, since she was a child. 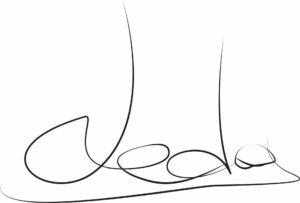 She decides to represent the world for what she wanted it to be, through a pencil and a sheet; and everyone realizes that Leda’s drawings are actually full of details. Details will guide the creativity, so much so that the design process that Leda applies starts from the detail, unlike many other designers. The childhood in Calabria, spent in the grandparents’ villa, together with her older brother and her cousin, is a very sweet memory, far away, but constant in her stylistic research. Roman adolescence, on the other hand, accompanies her slowly in studies and characterizes her organizational skills. Source of great aspiration is her maternal grandmother, who used to make garments for her three daughters. Her elegance, her subtlety and charm are an example of a beauty to which Leda aspires every time she draws a sketch. 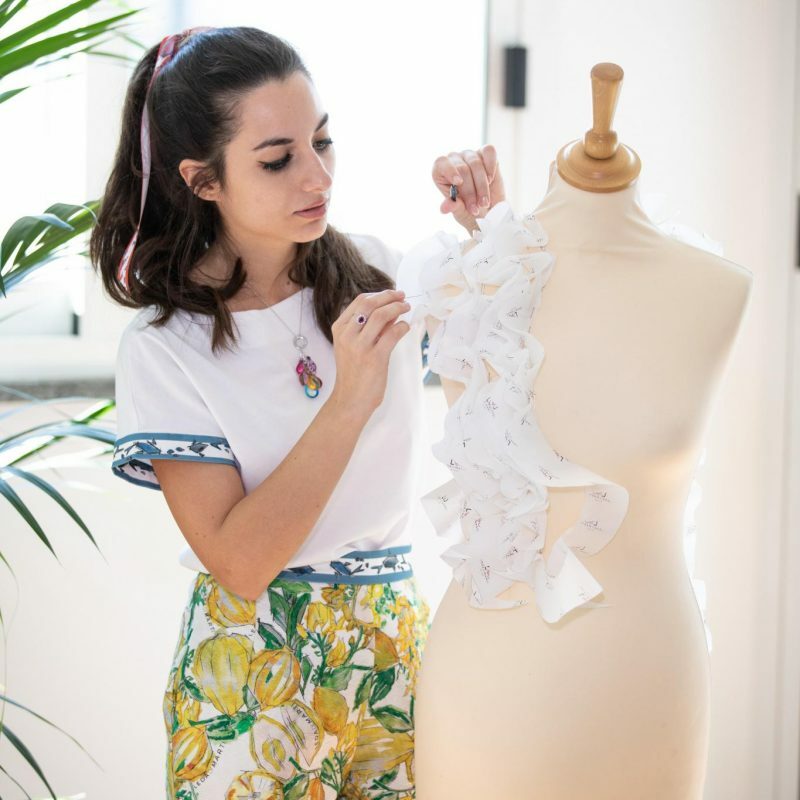 It is precisely the love that her grandmother, of Sicilian origin, dedicates to art forms such as embroidery, packaging and embellishment, combined with a Leda’s stubbornness, which leads her, after Classical studies in Rome, to join the Academy of Costume and Fashion of Rosana Pistolese. The three-year course of study of Costume and Fashion dissolves as fast as in a dream. At 21 years, Leda is in Bologna, where she experiments a thousand techniques, among the most refined, for fashion couture, over one of the most prestigious and ancient tailors of the city. Her taste is modeled on sartorially excellent garments, so her first inspiration is High Fashion. It will be in particular the Middle East, to fascinate it, whose culture is full of golden embroideries, familiar and mysterious at the same time. Leda’s first collection of 2015 is created in her tailoring in Calabria and it is called Imago Veli. It’s a riot of hand-embroidered flowers, impalpable fabrics, silk chiffon and organza, see-though and overlapping tulle, all in pastel tones. Leda decides to combines with the evening gowns collection, an essence, which will also be called Imago, which creates by analyzing the aromas of cedar, bergamot, mixed with a woody tone. She moved to London for an intense season, at the end of which she returnes constantly to assist her beloved clients. 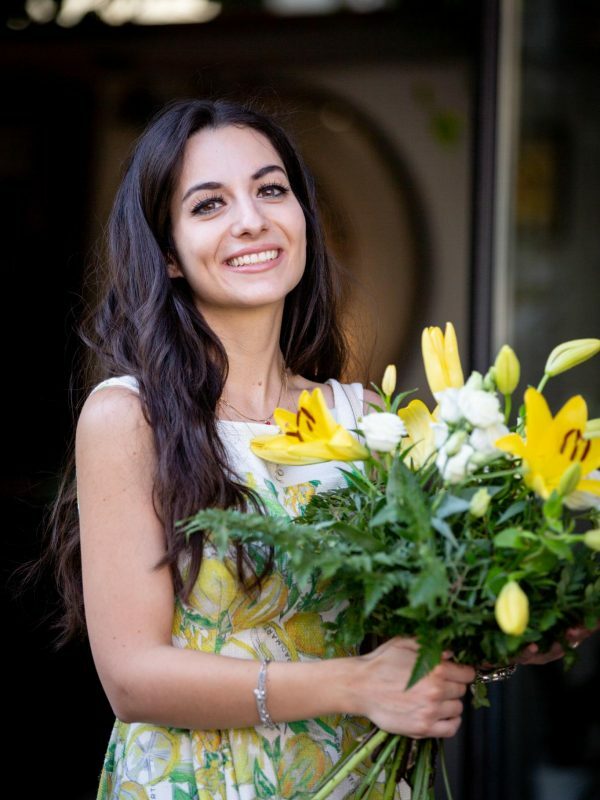 Here she has the lucky chance to meet and become friend of the wife of the Italian Ambassador in London Mr. Terracciano, for whom Leda creates clothes for important events such as the Queen’s Tea Garden Party. Her creations are, as required by the English label, complete: coat, hat and dress. 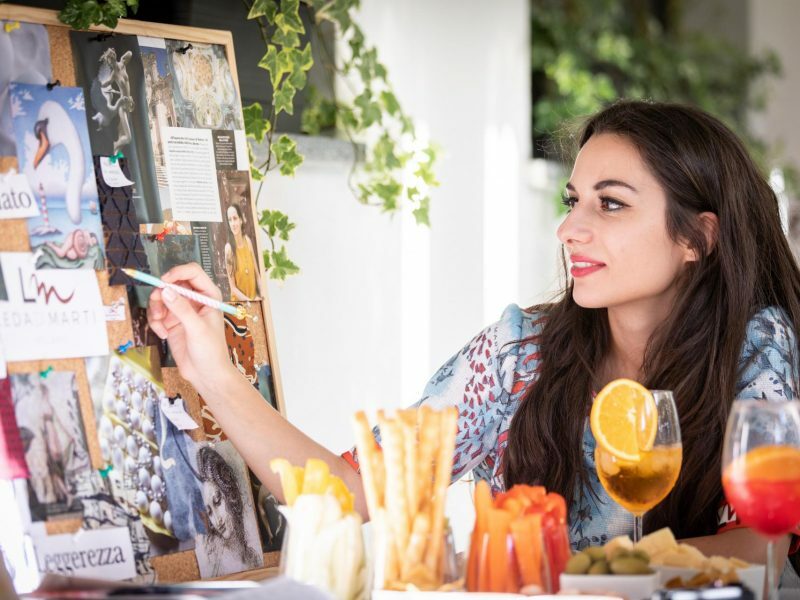 Mrs. Karen Terracciano hosts Leda Di Marti several times within the Italian Embassy to promote her brand as Italian excellence abroad, in wonderfully refined events. When she was offered a role as designer of embroidery at Marc Jacobs in New York, she leave to USA. Just in NY, she has the opportunity to admire the marvels of the Carolina Herrera house, designing prints and jacquards, which are produced in Como by an important printing and textile company; and explore the modeling behind Kate Spade’s creations. The American experience, allows her to deepen and discover new aspects of medium-high and high-level commercial production. Leda returns to Milano only after three and a half years, at the end of 2017, to launch her homonym brand Leda Di Marti, 100% Made in Italy ready-to-wear brand. Her collections speak of the beauties of the South, and in particular of her land, Calabria. There is, however, a strict mythological connotation, as indeed suggests her name, which leads her to study and deepen the traditions and myths of Magna Graecia.